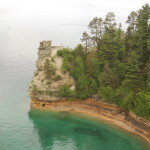 When people think of the Pictured Rocks National Lakeshore, the first picture that comes to mind is often Miners Castle. This easily recognizable natural landmark is now featured in Artprize 9 during portions of September and October thanks to Michigan based artist Michael Ingle. 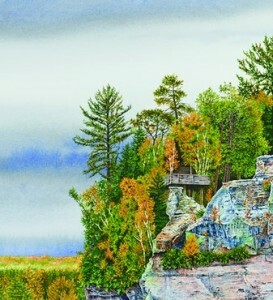 The painting titled “Miners Castle” shows the unique view of Miners Castle that is viewable from the water and not from the frequently visited overlook high above Lake Superior. Michael Ingle enters “Miners Castle” as a 2D watercolor in Artprize 9. This is the third consecutive year Mr. Ingle has competed in the art competition held annually in Grand Rapids. 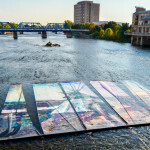 His Artprize piece is located at the JW Marriott hotel in downtown Grand Rapids. Artprize 9 marks the third year for Ingle in the art competition. 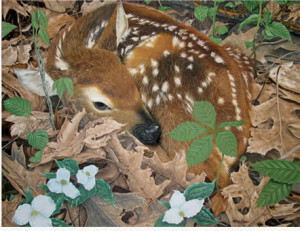 You may remember his other two paintings, which also were featured at the JW Marriott. 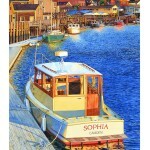 Sophia in 2015 was a 2D painting of a boat measuring 32” x 40”. 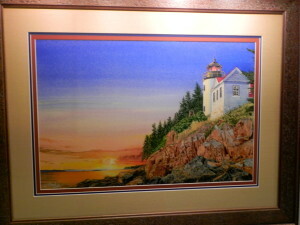 Ingle’s 2016 work was a 2D watercolor showing Bass Harbor Lighthouse (Maine) in a 38” x 28” piece. This year’s piece is the largest watercolor Ingle has ever done. 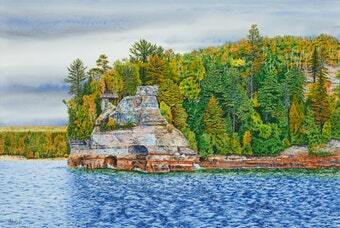 “Miners Castle” measures an impressive 62” x 43” x 3.5”. Ingle told us he stuck with watercolor as it is what he does best. Along with the larger size piece comes an intense amount of time to create this artwork. Ingle estimates he spent 150 hours creating “Miners Castle” for Artprize 9. Surprisingly enough, Ingle has only been to Pictured Rocks once. The setting must have stuck with him as this is a great portrayal of this Michigan landmark. Ingle used several references for this piece and says the he really liked the viewing platform. 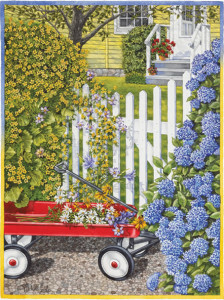 Ingle really wanted to do a Michigan landscape this year for Artprize as well. This original painting is for sale and an undetermined number of prints of Miners Castle will also be offered up for sale. 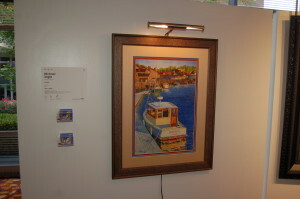 Ingle’s other two Artprize pieces are also offered as prints for yourself or as gifts. From personal experience, the Bass Harbor lighthouse print from last year was a great Christmas present for my father and now hangs in his living room. 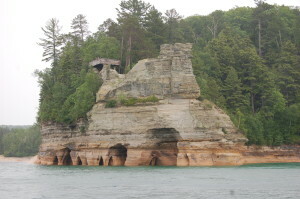 When asked about this particular unique view of Miners Castle Ingle said, “I like to pick landscapes that people have seen. I like to paint them from the most common photo taking places. I then attempt to paint in a way that is much more dramatic in color and light then the photos.” This view of Miners Castle isn’t as common, but kayaking in Pictured Rocks with a company like Uncle Ducky Outdoors (see our review) can get visitors near Miners Castle in the water. 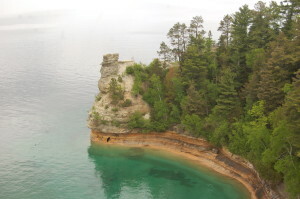 Pictured Rocks celebrated its 50th anniversary in 2016 with record attendance. In 2016, 777,428 people visited the Pictured Rocks National Lakeshore. This was a 7.5% increase from a strong 2015 (the National Park Service centennial) that saw 723,178 visitors. Both years saw a strong increase over 2014’s total of 527,897 visitors. Ingle is the owner of Illustration Design by Ingle, offering services like advertising, logo design, web design, and marketing. 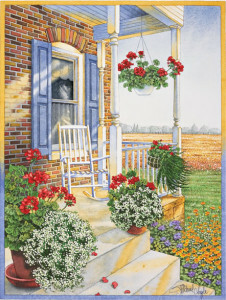 Ingle is also an artist who enjoys painting pictures like this or commissioned ones on request. Ingle is currently working on a commissioned piece. Feel free to reach out to Michael Ingle for help with any of these items, any painting requests, or to purchase prints of any of his three Artprize pieces. Email and phone number are available on his website. Ingle will also be at Artprize portions of September 22nd through 24th to chat with guests. To find more about Ingle’s work and prints for sale, check out our last article with him that also features his five favorite places in Michigan. When asked about Artprize 10, Ingle already has one idea in the works, another Michigan landmark (lighthouse). We think you’ll love seeing Ingle paint a Michigan lighthouse after seeing his great landscape watercolors and the Bass Harbor Lighthouse painting last year. 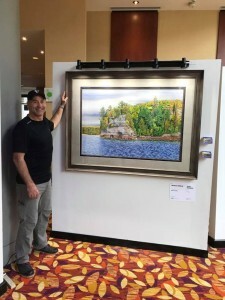 Please check out this great painting of Miners Castle at the JW Marriott and vote 66022 on the Artprize app. 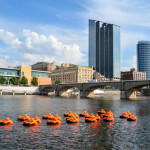 Artprize 9 runs September 20th through October 8th. Thanks to Michael Ingle for taking the time to talk to us once again.